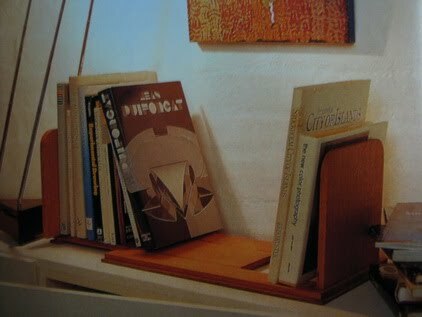 An adjustable book slide is the perfect gadget for keeping your collection of novels and reference books attractively displayed. Its adjustability allows for books to be removed or added, yet the ends can be kept tight and the books will remain upright. The slide comprises two lengths of tongue-and-grooved boards, one of which is ripped into halves to make the two joints. The tongues are sanded or planed down to give enough clearance to make the slide slip. They are secured to a mitred base frame (although they could also be fixed to a ply or particle board panel). The ends on our slide are hinged, which means the unit can be stacked easily when not in use. 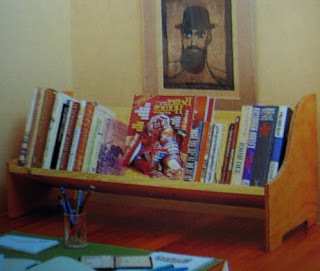 Another alternative is a desk bookcase. This desk-top bookcase is for the home office, den or a child’s room. It will keep those much-used volumes tidy and close to hand. 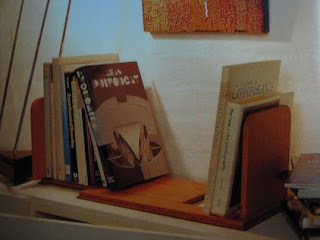 Its tilted shelf locks the books snugly in place even if it’s not full.Timber and ply has been chosen for this example, but the bookcase could be made completely from ply or medium density fibre board (Customwood) and painted.